You can take hold of God’s perfect peace today! God wants to give you His peace! It’s the peace that passes all understanding. It doesn’t make sense to the world, but this peace is very real and available to you right now. The Word of God tells us that as believers, we can truly be anxious for nothing! The Anxious For Nothing 2-part CD series, plus the Philippians 4:6-7 frameable art print. 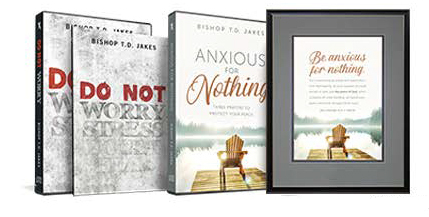 The 4-CD set Do Not Worry with companion journal plus the 2-CD series Anxious For Nothing and the frameable art print of Philippians 4: 6-7. Remember, God has made a way for worry, stress, and fear to be banished from your life. Take hold of the promises of God, claim what’s yours as blood-brought believer, and live in God’s perfect peace today!